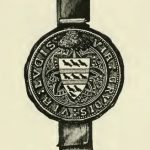 Thomas Moring, a 19th century “die-sinker, gem engraver, heraldic artist and seal engraver” was known to have been active from 1840 to 1900, appearing in records at an address in Lincoln's Inn Fields and then later in High Holbern. 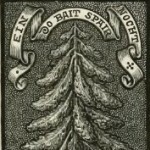 The engraver also seems to have been a prolific ex libris artist and in the early 1900s a collection of his book plates engraved on wood and printed directly from the blocks - One Hundred Book Plates Engraved on Wood by Thomas Moring - was published by the De La More Press, a publisher founded by Alexander Moring in 1895 in London, England and specialising in works on art and literature. 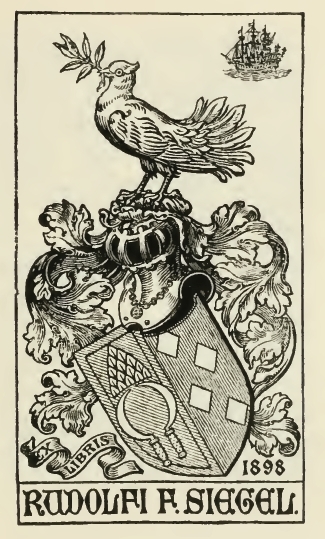 The book included an introduction on the art of engraving book plates on wood by Alexander Moring and descriptive notes for all plates. Boldly treated crest and helmet. 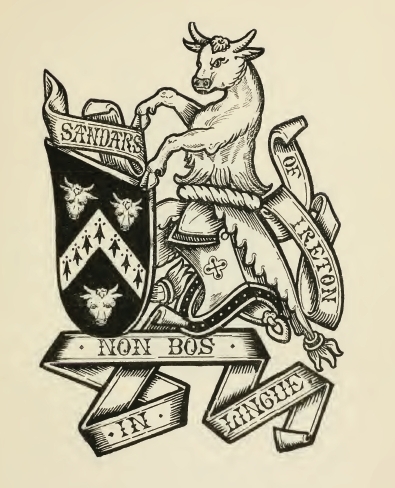 This illustrates the treatment of the medieval heralds in their rendering of crests. 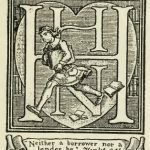 A good example of unconventional treatment for library interior. 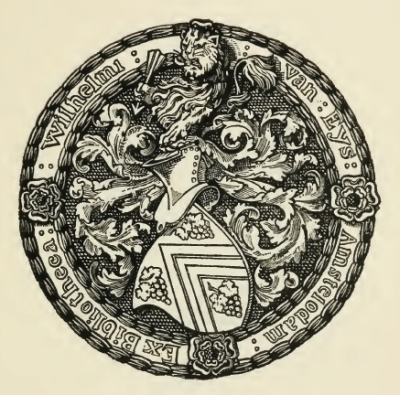 Fine circular Ex Libris with arms, and legend in border, Ex Bibliotheca Wilhelmi van Eys, Amstelodam. 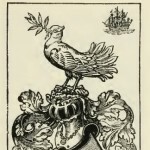 Armorial block of Capt. 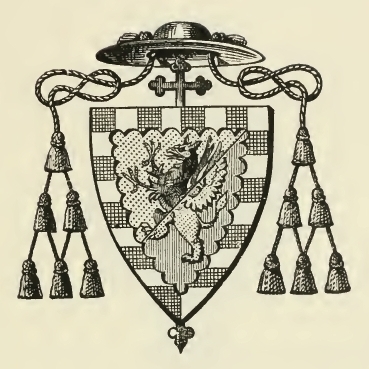 Rudolph F. Siegel, with emblem of ship. 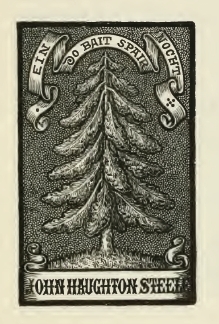 […] Dealing more particularly with the class of design for which the wood-block is most suitable and to which we have entirely devoted this volume, it is noticeable that the Germans not only were the first to adopt elaborate designs, both in this style and in the more finished style of the copper plate, but that the artistic qualities of their Book Plates, even from the very earliest examples, are far ahead of those of any other country. 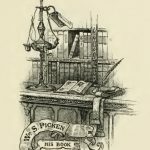 Considerable controversy has taken place as to the cause of this pre-eminence, but the Teutonic vigour of character has no doubt a great deal to do with the readiness to appreciate fine work, while the great number of small princely courts each vying with the others in their desire to have the very best, both of books in their library and of labels to show the taste of their respective owner, created a demand which attracted and developed the talents of some of the finest minor masters of the time. 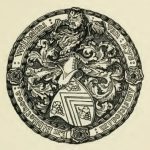 In the search for good examples it is therefore only natural that we should turn to the older German Book Plates, and the majority of the examples in this book are founded upon the excellent work of Dürer and his contemporaries. 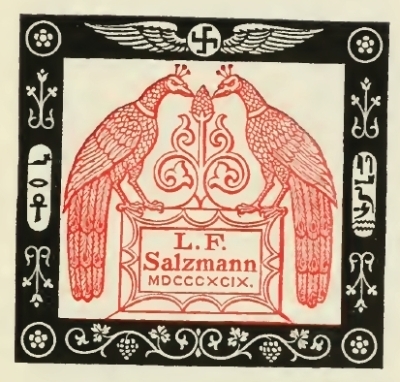 Symbolic Book Plate in red and black, designed by the owner, L. F. Salzmann, Esq. 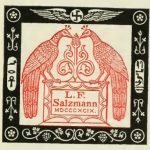 Pictorial Design. 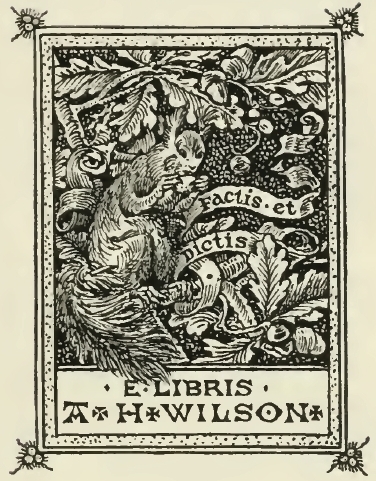 A. H. Wilson, Esq. 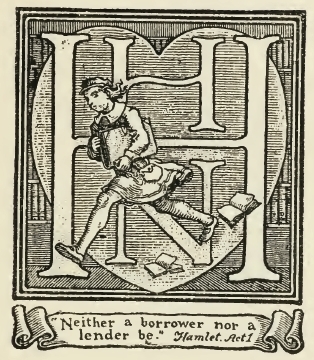 Book Plate with monogram and heart with figure and scroll. 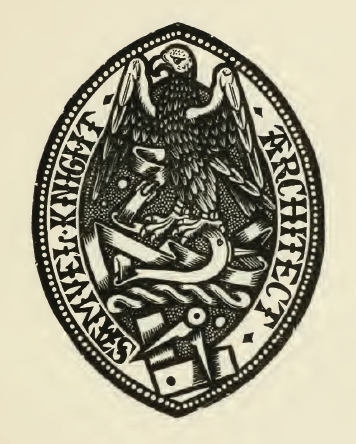 Ex Libris of Samuel Knight, Esq., Architect. 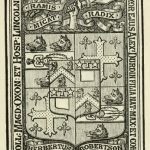 An interesting heraldic Book Plate, with quarterings. 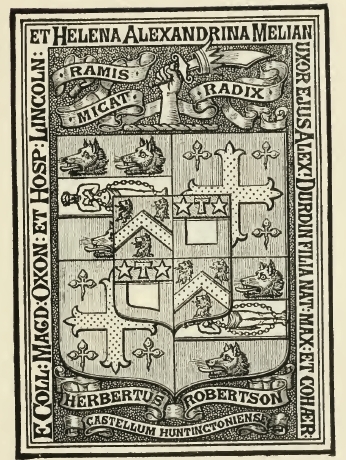 Herbert Robertson, Esq., M.P. 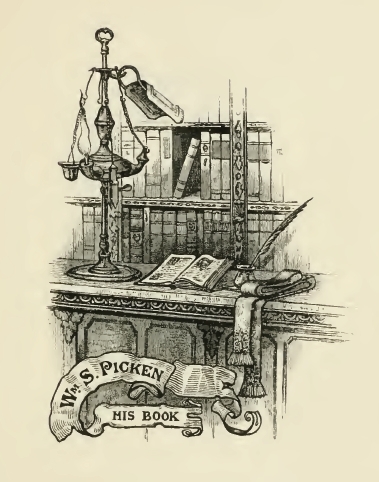 Emblematic Ex Libris of the Rev. 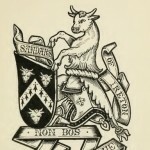 John Houghton Steele. 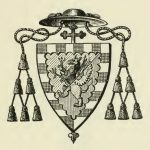 Armorial Book Plate with archbishop’s hat and cross. 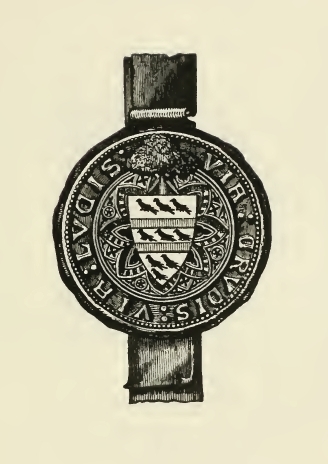 Heraldic design representing a Gothic seal, with ribbon attached. 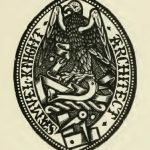 As so many books are available on the history of Book Plates, it is unnecessary to discuss at length the different styles of designing and engraving; we will therefore leave the following examples to speak for themselves as representing work of a modern artist, who has founded his style largely upon the examples of the best early periods. 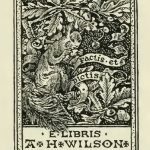 This entry was posted in Bookplate Artists and tagged Antique Ex Libris, Bookplate Designer, Thomas Moring. Bookmark the permalink.